Students meet with a Learning Specialist four time a week, who uses brain-based research to help them develop academic skills that will serve them well as lifelong learners. Students can meet with a Learning Specialist in different class configurations (1:1 and 4:1) and have the ability to take content skill building classes like Math Skills, Reading Skills, and Advanced Reading & Writing for academic credit. 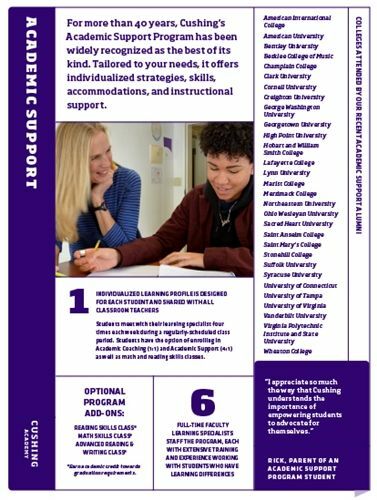 Students come to Academic Support with a variety of profiles that often include challenges such as ADHD, dyslexia, executive function, test anxiety, and health impairments that impact how they process information, function in the classroom, and produce work. 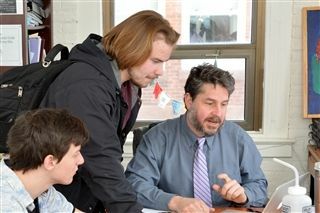 A dedicated part of Cushing’s inclusive community, our Learning Specialists bring years of training and experience to their work with students as they progress through a general education curriculum. Learning Specialists help students develop self-advocacy, self-confidence, academic skills, and important transferable skills for college and professional life. 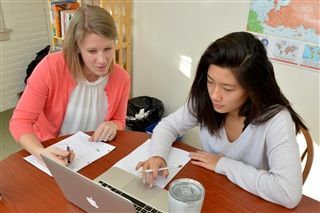 They also help students apply for accommodations for standardized testing and work with the College Counseling Office to identify higher education institutions that match students’ interests and educational goals. 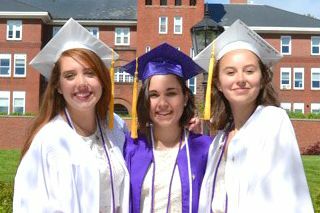 If you have any questions regarding the Academic Support Program, please email academicsupport@cushing.org.